Poetry, Poets Readers is a defence of poetry against the protective moves which claim that poets never lie because they never affirm, or that their poems exist in a separate 'world'. These much reiterated manoeuvres for safeguarding poetry by banishing it from an active role in life can paradoxically go hand in hand with a poet's yearning for the authority of a legislator. 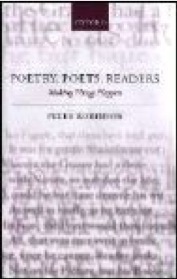 Through detailed considerations of poetry by Shakespeare, Keats, Edward Lear, Yeats, Auden, Elizabeth Bishop, and Paul Muldoon, along with sustained meditations on question-forms in poems, the role of fact in fictions, the nature of literary value, speech acts and performative utterances issued by poets, the book sets out a fresh model for relationships between poetry, poets, and readers - one which allows the historical fact of poems having made things happen to be itself happening. 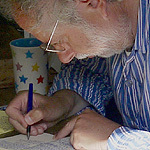 Peter McDonald wrote in the TLS that 'Robinson's corrective approach is stern on any postmodern escape-clauses to get writers off the hook of knowing what they mean or meaning what they write; but his criticism insists on the really important questions to which only the best poetry is equal. This is to reclaim for poetry the seriousness and centrality it demands; as Robinson writes: 'imagination is not just a special quality added on to life by creative people, but a necessary requirement for life to continue for every one of us'.